The Schluter-TREP-E is designed to protect a tiled surface on stair edges while providing an; easily visible, slip resistant wear surface, safe, durable stair-nosing design. The Schluter-TREP-E profile is made up of stainless steel which makes it particularly suitable for areas that are subjected to heavy foot traffic such as public malls, and office buildings. 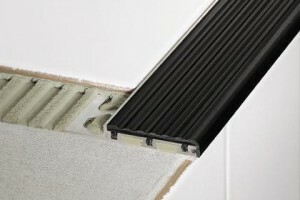 The Schluter-TREP-E can be integrated into stairs that are covered with natural stone or tile. The Schluter-TREP-E wears surface meets or exceeds the coefficient of friction that is recommended in the American with Disabilities Act (ADA) for any use in application where a risk of slipping can occur. The Schluter-TREP-G is designed to protect a tiled surface on stair edges which providing a wear resistant surface that is easily visible and exceptionally durable. The material is made out of Stainless Steel with a special slip-resistant tread that makes it particularly well suited for heavy foot traffic found in public malls and public buildings. 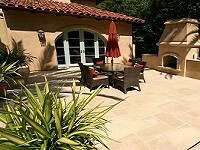 The surface features a self-adhesive, slip-resistant treat that is embedded with a special mineral grain coating. The treads are available in a variety of colors; Black, Nut Brown, and Yellow in case of damage or excessive wear. 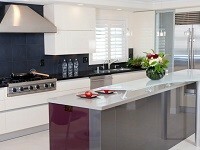 The profile can be integrated into stairs covered with tile or natural stone. 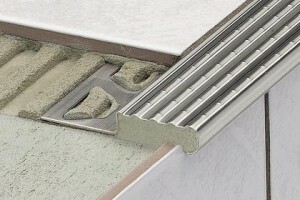 The Schluter-TREP-FL is a decorative stainless steel stair-nosing profile that has a protruding rounded edge that can be integrated into stairs covered with either stone or tile. The stainless steel profile is meant to protect the edges of the stairs while adding a high degree of safety by improving the visibility of the stair edges. The Schluter-TREP-FL is suitable for a wide variety of applications such as light traffic in a residential application to heavy trafficked applications such as a public office building or public mall. 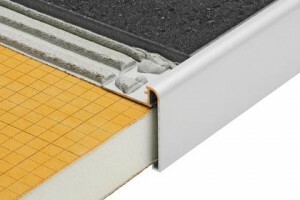 The Schluter-RONDEC-STEP is a finishing edge profile that is meant for countertops when the use of ceramic tile, porcelain tile, or stone tile was used. 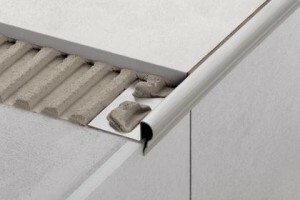 The profile effectively protects tile in the edge area from mechanical and impact stresses. 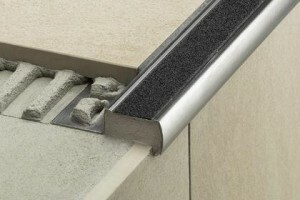 The integrated joint spacer establishes a defined joint cavity between not only the tile but the metal profile as well. The Schluter-RONDEC-STEP is suitable for residential applications such as stairs that are not exposed to heavy traffic and countertops.